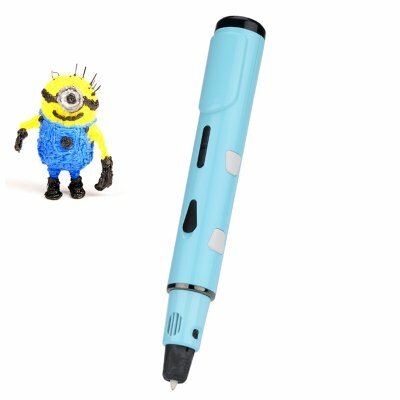 Successfully Added 3D Modeling Stereoscopic Extrusion Pen - Temp Control, Speed Control, Includes 3 Filaments (Blue) to your Shopping Cart. Rather than using ink this 3D pen melts a thin plastic filament and extrudes the molten plastic allowing you to create a free form model from you creative imagination. With a steady hand you can draw and create your own models creating fancy decorations. The plastic is exactly like that which comes out of a 3D printer but as the pen stays close to the melting point of the filament it will set very quickly after leaving the nozzle. By adjusting the speed control and temperature settings you can draw in the air. With a steady hand and a little patience you can express your artistic side creating all manner of 3D structures from fancy name cards to accurate scale models as well as jewelry and decorations. Another use for these extrusion pens is as a finishing tool using the hot plastic to glue 2D forms into a final 3D shape like a welding tool for plastic. This lets you repair plastic models or add finishing touches to your 3D printed products. These plastic doodlers are the perfect extension for your creative ambitions and let you bring your ideas to life in 3 dimensions without the need to create extensive design plans to feed into a typical 3D printer. This 3D stereoscopic pen comes with 3 filaments to get you well on your way and has a 12 months warranty. Brought to you by the leader in electronic devices as well as wholesale cool gadgets, Chinavasion..